Thebe Bagwasi, O.D. received his Bachelor of Science in Biology from University of Missouri – St. Louis in 2000 and his optometry Doctorate degree from UMSL School of Optometry in 2003. He is a member of American Optometry Association and Missouri Optomerty Association and National Optometry Association. 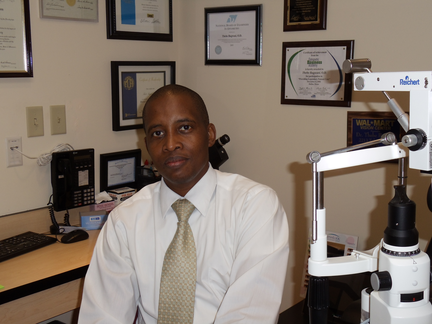 Although Bagwasi Family Eyecare is located inside Walmart, Dr. Bagwasi is independent and does not work for Walmart. Dr. Bagwasi was born and raised in a southern African country of Botswana. His hobbies are playing guitar, swimming, travelling and listening to gospel music.